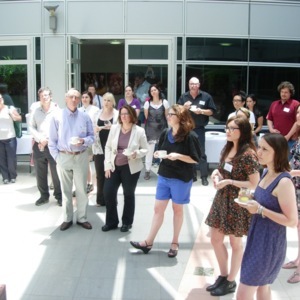 This photograph was taken during the official opening of this website - Medievalism in Australian Cultural Memory. The opening address was given by one of the researchers for the website, Dr Joanne McEwan, during the International Medievalism and Popular Culture Symposium held at the University of Western Australia on December 4 and 5, 2011. Delegates were later invited to test-run the website. “Medievalism in Australian Cultural Memory – Official Opening ,” Medievalism in Australian Cultural Memory, accessed April 25, 2019, http://ausmed.arts.uwa.edu.au/items/show/676.